Stainless steel scleral fixation ring set. 12mm in diameter. Stainless steel scleral fixation ring set. 13mm in diameter. Stainless steel scleral fixation ring set. 14mm in diameter. 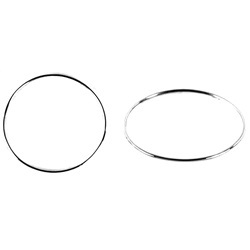 Stainless steel scleral fixation ring set. 15mm in diameter. Stainless steel scleral fixation ring set. 16mm in diameter. Stainless steel scleral fixation ring set. 17mm in diameter. Stainless steel scleral fixation ring set. 18mm in diameter. Stainless steel scleral fixation ring set. 19mm in diameter. Stainless steel scleral fixation ring set. 20mm in diameter. Stainless steel scleral fixation ring set. 21mm in diameter. Stainless steel scleral fixation ring set. 22mm in diameter. Stainless steel scleral fixation ring set. 23mm in diameter. Stainless steel scleral fixation ring set. This set includes 8 different sized rings that increase in 1.0mm increments. Diameter sizes include: 16mm, 17mm, 18mm, 19mm, 20mm, 21mm, 22mm, and 23mm. Stainless steel scleral fixation ring set. This set includes 12 different sized rings that increase in 1.0mm increments. Diameter sizes include: 12mm, 13mm, 14mm, 15mm 16mm, 17mm, 18mm, 19mm, 20mm, 21mm, 22mm, and 23mm.